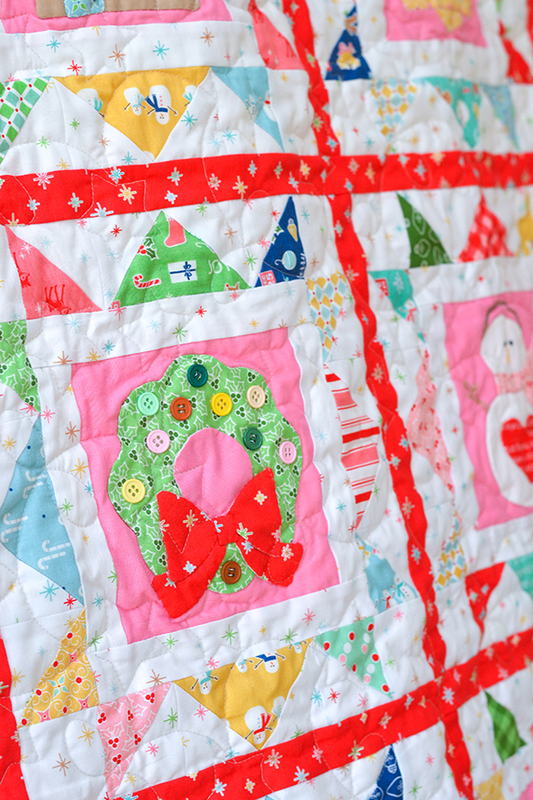 Down Grapevine Lane: Cozy Christmas Quilt + Happy New Year! Hello dear friends! Hope you had a lovely festive period with your loved ones. I've had a glorious week's holiday, recharging batteries and enjoying lazing about in the company of my lovely family and dear friends (and nursing a hangover from our Boxing Day party - oops!). It felt so good to be able to put my feet up and relax, do some lazy sewing when I felt like it, and not to have the crazy rush of meeting urgent deadlines, every single day. It was bliss! 2016 has been such a roller coaster of a year! 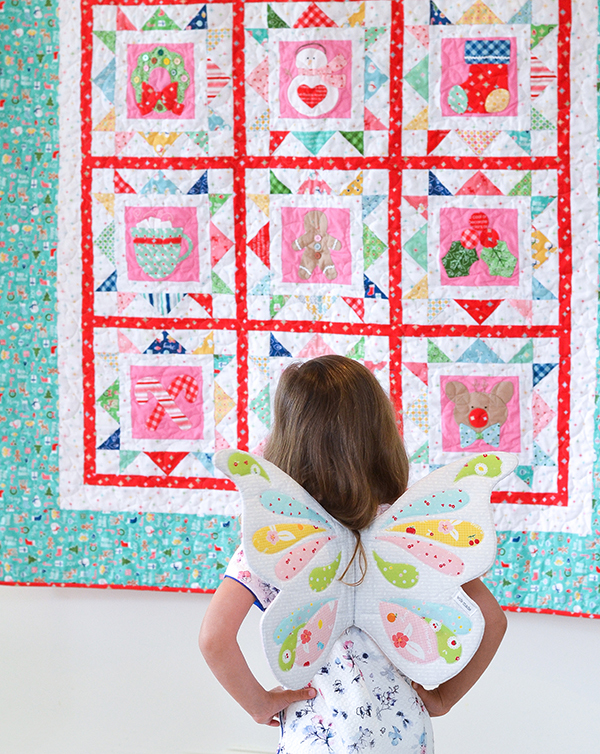 It's been the best year for me professionally, as I not only signed as a fabric designer with my dream fabric company (Riley Blake) but also published my first quilting book! 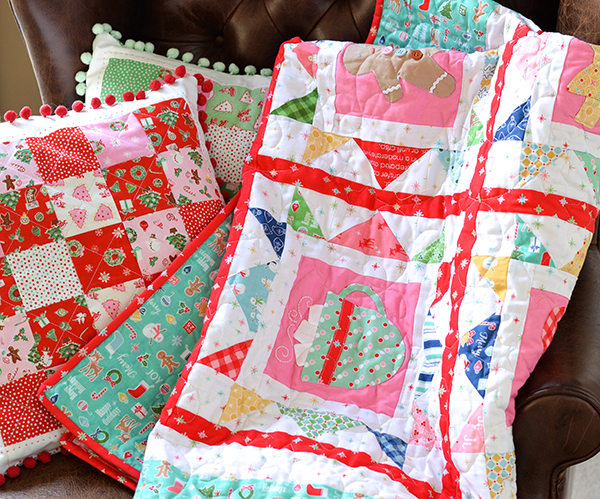 As far as quilty dreams go, it doesn't get much better than that! But of course, my learning curve was literally vertical, which meant a lot of insane working hours till silly o'clock every night - I can honestly say I've never worked so hard in my life (and that's something coming from an ex-management-consultant-investment-banker who used to regularly clock 90 hour weeks!). The year got more challenging after my husband had a serious bike crash in May, and the few months that followed whilst he was in recovery were difficult and traumatic for all of us (he has luckily made a full recovery, but boy, what a wake up call that was!). So 2016 was a mix of highs and lows, and I am so grateful for not only all the incredible opportunities that came my way but also the challenges - as they taught me what's really important in life, showed me how strong I am and that I can get through anything with the neverending love and support of my amazing life partner (and our two lovely kids). They really are my whole world 💖💖💖. In the last few weeks of 2016 I set out on a mission to complete as many UFOs as possible, starting with the festive Christmas-sy ones. 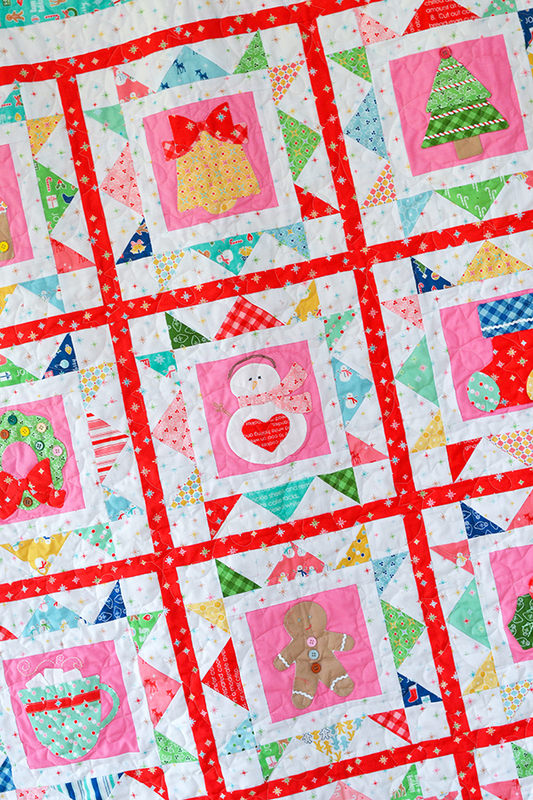 The last one I completed was my Cozy Christmas quilt (pattern by my quilty idol and fellow Riley Blake designer Lori Holt which is a free download here). 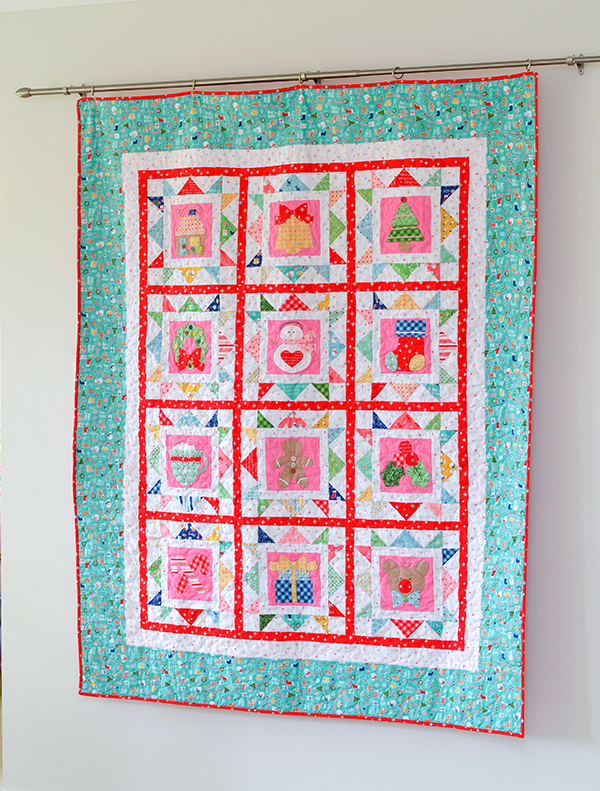 I fell in love with this quilt when I saw it at the spring quilt market and absolutely had to make it, exactly the same, using Lori's Cozy Christmas fabrics. 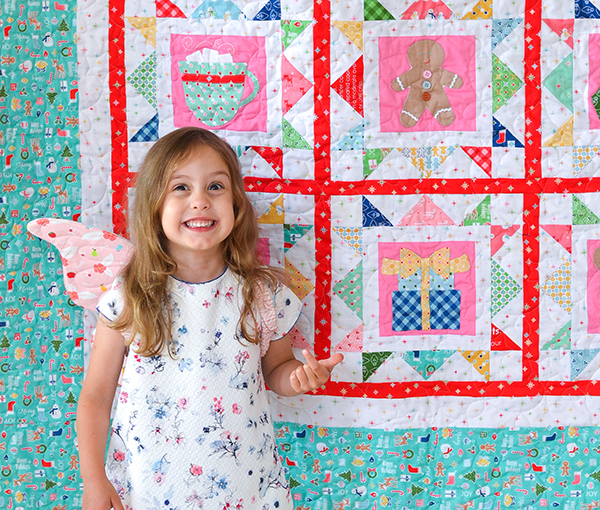 Isn't it the cutest quilt, ever? 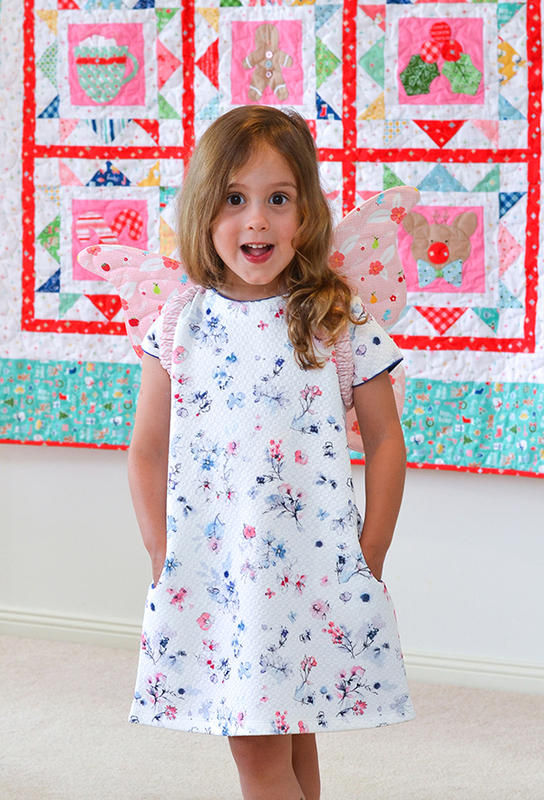 Alice is head over heels in love, as you can see! 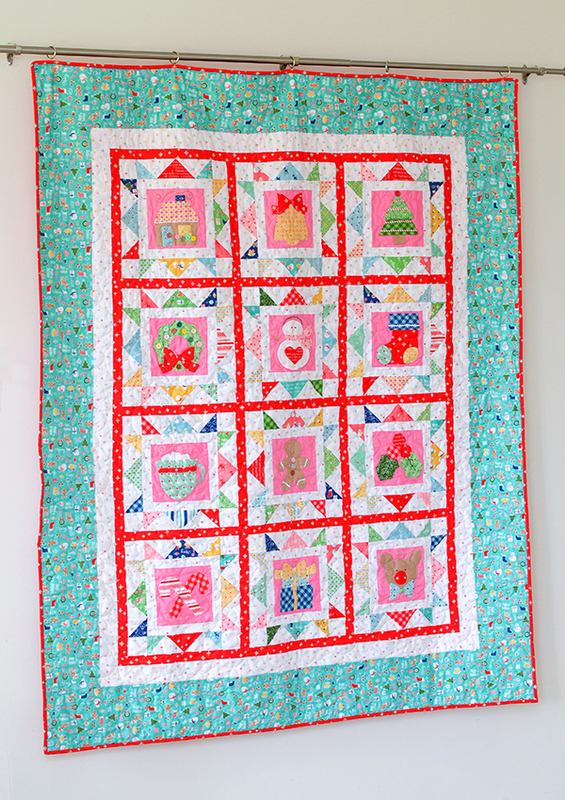 For the backing I used a sweet pink dotty print that I bought from Ministry of Fabric, and machine bound this quilt. 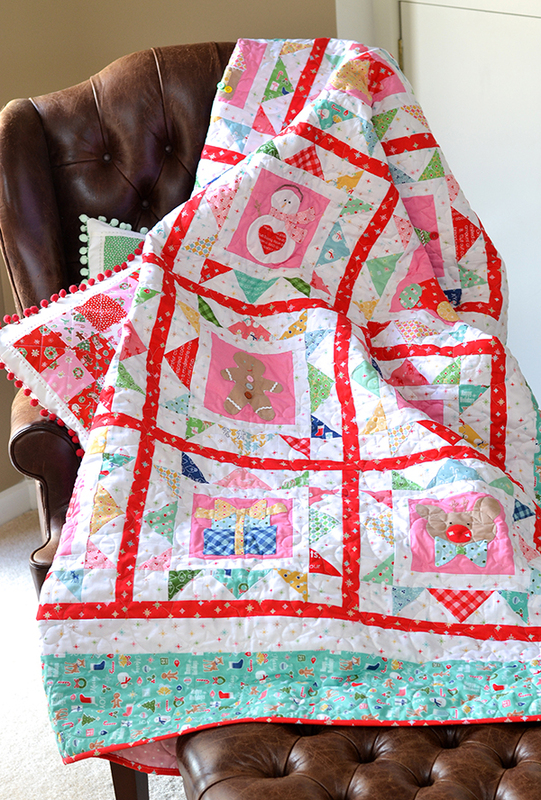 I learned how to do this recently by following this tutorial by Rita from Red Pepper Quilts - I now bind all my big quilts on the machine! It's so incredibly fast! 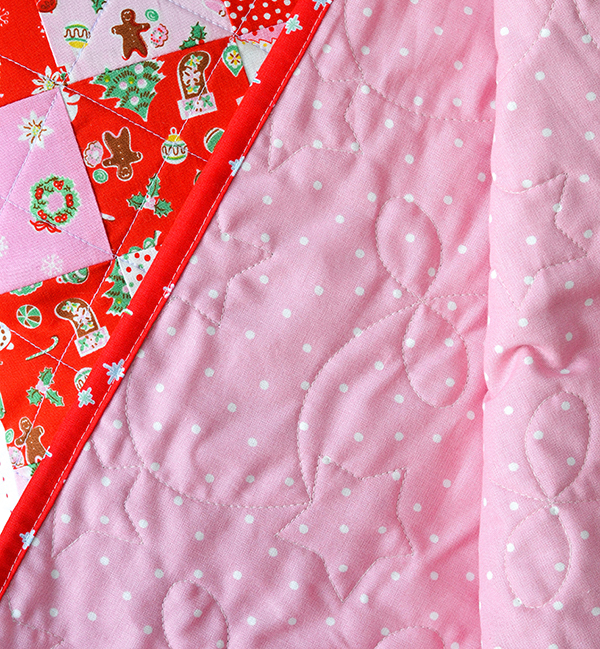 And you stitch in the ditch between the edge of the border and the binding, so no stitches are visible at the front of the quilt. I have one more day's holiday to enjoy, then I get back to work all freshened up and ready to rock'n roll! 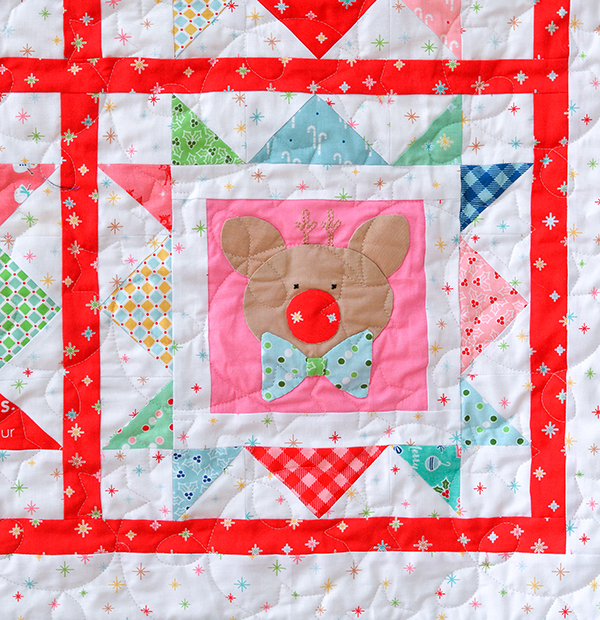 I have some great things coming up this year, including my next fabric collection, the roll-out of my paper pattern collection, and another huge project that I can't quite talk about yet. So many good and exciting things in store! And our year got off to a great start - after family cuddles in bed, I made pancakes for breakfast. Hubby declared them 'the best pancakes he had the whole year!'. Ha! 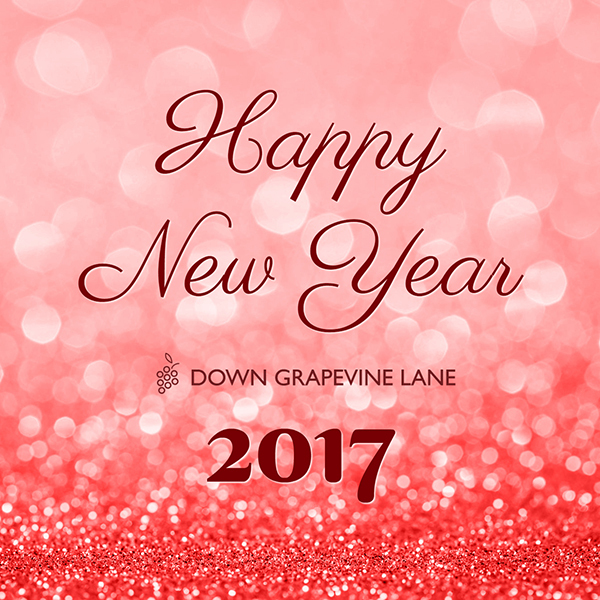 Wishing you all a very happy new year - may 2017 be the best year yet for all of us, and bring everyone lots of love, happiness, hope and peace! 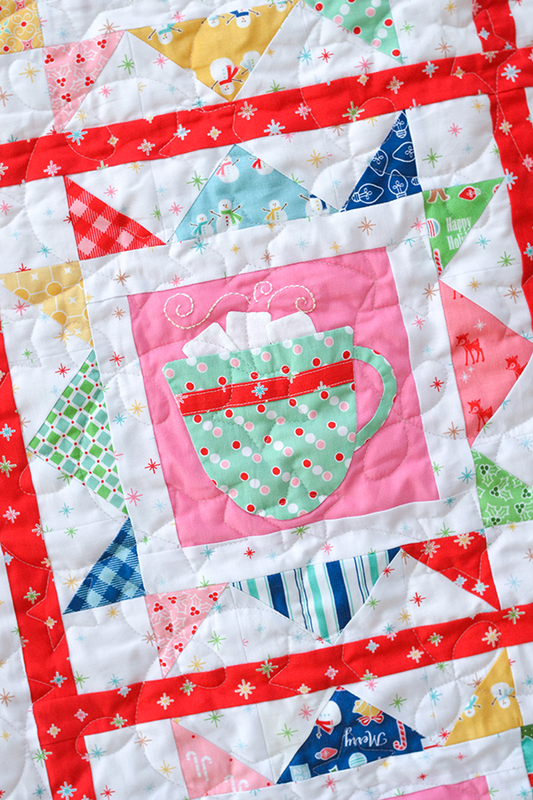 This is a really beautiful quilt. I just love it. Your daughter is so cute. She looks wonderful in the wings! Happy New Year, Sedef. Best wishes for a lovely year!